Source Improvement Project — Brown Coffee Co. Sometimes the projects are small one-off projects. Others, like this one, are multi-year projects that will fundamentally alter the trajectory of a farm, mill or cooperative. Below is our first SIP we’re undertaking in rural south central Kenya. Project Synopsis: 3-year project to upgrade mill’s analog scale and accounting system with a digital, networked scale; improve records and payments processes for cooperative members; replace aging wooden coffee drying tables with steel tables; facilitate farmer education workshops to improve farm management processes and boost production. Thiririka Mill uses handwritten carbon copy forms to keep coffee delivery and payout records, which can become damaged, lost or be susceptible to human error. Upgrading to a digital, networkable scale will record in real-time the mill’s activity and payouts to all cooperative members, resulting in perfect accuracy, offsite information redundancy and cost savings. There are about 300 active members of the Githembe “Society” (or “Cooperative”) who bring coffee cherry—the unprocessed coffee seeds harvested directly from the trees—to the Thiririka Mill several kilometers up the road. Most of these producers have small tracts of land and grow coffee next to corn, bananas, avocado trees or macadamia trees. Coffee cherry is brought in each afternoon during harvest in large sacks and weighed on an antique scale, and the daily totals for each person are tallied by hand by one of the cooperative’s officers using handwritten carbon copy forms kept in an old file box. After weighing the cherry at the scale, the producer receives a carbon copy slip of the day’s activity and must keep the form to ensure payment when the lot they contributed to is sold. An upgraded, digital networked scale greatly improves tracking volumes and payments and will boost speed and efficiency at the mill during busy harvest season. Each day’s coffee cherry is depulped before being set in a fermentation tank with water for 24-72 hours, then brought out to dry on the 190 wooden drying tables at the mill. The wooden tables are in need of replacement. Upgraded steel tables will last several decades, helping the mill and cooperative reduce long-term operating costs. Total Table Replacement Cost Year One: $13,000USD. Thiririka Mill currently has 190 drying tables. Year One begun the process of replacing 20 of the 190 wooden tables currently in use with long-lasting steel tables. Year Two will replace 85 more tables. Each table is 5’W x 75’L with steel legs and frames and a wire mesh “table top” that beans are dried on, allowing airflow from above and below. The cooperative members take turns attending to the tables, turning beans hourly in the sun to facilitate even drying. Each table can dry 700-800 kg of coffee and drying each lot on a table takes between 4-6 days. Old wooden table frames need mending every 2-3 years. Steel tables will last and estimated 35-40 years, greatly reducing maintenance and replacement costs. Brown Coffee Company partners with Neumann Kaffe Gruppe in Kenya to help us with the logistics of getting this coffee to our guests in Texas. NKG has offices in practically every coffee producing country in the world. Their knowledge and resources around coffee production are significant. NKG offers a wide range of services and partnerships with smallholders across Kenya to help them develop their own resources to create greater sustainable value. One such resource offered are week-long training workshops at their Kenya headquarters near Nairobi. For about the price of a cup of coffee per attendee, NKG instructs smallholders on best practices involving soil and plant management; shade ecosystems development and more. Brown intends to provide funds for the 300 active members of Githembe Cooperative to attend these workshops to help them boost their harvest volume, the quality of coffee they are harvesting and the environment they are producing it in. The workshops will directly benefit the smallholders with higher yields and higher quality premiums while creating a more sustainable local ecosystem. Total Cooperative Workshop Attendance Cost: $1,500USD. Total Table Replacement Cost Year Two: $55,250USD. There are currently 190 wooden drying tables at Thiririka Mill, very many of which are in need of repair or replacement. The SIP will replace these tables with sturdy steel ones that will last for decades. Here you can see the day’s lots covered with yellow tarps in the afternoon for overnight protection from moisture and rain. 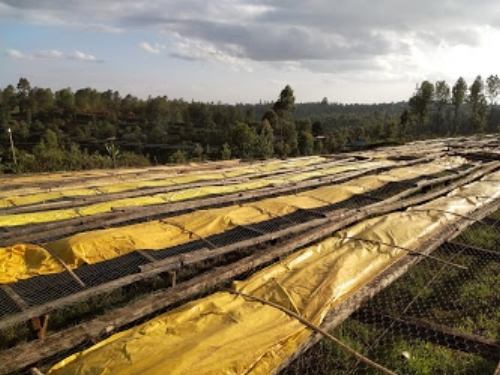 Tomorrow morning the tarps will be removed and the beans turned constantly in the African sun to ensure evenness of drying and a clean, consistent sweetness and acidity Githembe coffee is known for. Brown president Aaron Blanco meets with some of the board members of Githembe Cooperative to learn how they can collaborate toward quality, volume and efficiency improvements among Githembe’s members. The premium we currently pay for Githembe coffee is about 20% higher than our average for all other coffees we source, meaning we love it so much it’s worth paying extra for it. We currently purchase around 90% of Githembe’s AA (top quality) harvest each year, and have committed to purchasing 100% of the AA crop beginning in 2019. The final year of the project will see the remaining 85 drying tables replaced with new, high quality, durable tables that will last Thiririka Mill many years and enable them to have a stable foundation for the future. By the beginning of the third year of the project we should have much more information about the impact of the new tables, the digital scale and the workshops and can work closely with Githembe/Thiririka and NKG to assess how well the project has done and what improvements can be made to fine tune it further. The long-term goals of the project will boost average production volume per person while increasing quality, which will of course trigger higher premiums paid. Total Table Replacement Cost Year Three: $55,250USD. This is not a free handout. The costs of this project are being shared between Brown Coffee Company, Githembe/Thiririka and NKG. Your donations toward this project will make up about 30% of the total costs. Brown will contribute matching donations up to another 35%. Githembe/Thiririka members are contributing a further 31%. And NKG will provide the rest with in-kind donations such as set up, operation and maintenance of the scale in cooperation with Githembe/Thiririka in order to facilitate efficient information and speedy payments transfers to Cooperative members. NKG has generously offered to handle and oversee logistics for this project at cost (i.e., no currency exchange fees or maintenance/administrative fees). We are 100% confident in the transparency and efficacy of NKG’s accounting systems to receive and distribute funds for this project directly and solely for their intended purpose. It’s easy to help make this project a success and you can do it here or every time you come into one of our shops. On your computer or smartphone you can link directly to the donations page to make a tax-deductible donation in any amount to go toward any portion of this project. Simply follow the DONATE HERE buttons you see scattered above. We welcome all donations, including those from individuals or organizations wishing to make larger contributions. Please contact us at sip@browncoffeeco.com if you are interested in making an organizational donation. You can also help every time you visit our shops by matching your own coffee purchase with a donation toward the cause. We call it GET A CUP, GIVE A CUP. Each time you GET a cup of delicious coffee at Brown you can GIVE the cost of that cup of coffee as a donation toward this project right from the checkout register. It’s quick and easy. Any one of our baristas can give you more details at checkout.